Coralyne is close . . . the Basics are coming . . .
(I reviewed this book quite a while ago, but didn't post anything to the blog as I was having technical issues at the time). I was a bit unsure going into this one, since my first brush with Jack Vance (Suldrun's Garden: reviewed here) didn’t exactly win me over. But a friend was kind enough to send me this out of the blue, and since it’s so tiny, I thought I’d give it a go. It turned out to be just what I needed. I’d been struggling a little bit with my reading mojo, and being able to read something so quick and easy really helped, and made me eager to read more of the same – that is, fantasy with a hint of SF. 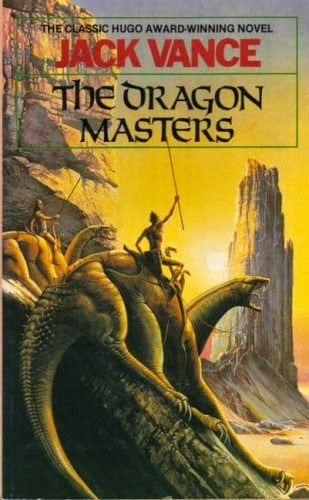 I’d been wanting to try SF for a while, and I think The Dragon Masters was a nice way of easing me into it. The story itself is fairly simple: far into the future, on a distant planet named Aerlith, the last of humankind live on a world where dragons and monsters are commonplace and are used in warfare, either as mounts or as soldiers. Every few generations, a star called Coralyne burns brighter than usual, and this always coincides with the arrival of the Basics, an alien race who turn up in spaceships and kill and capture hundreds of humans before leaving again. The leaders of men must find a way of defeating the Basics, and of appropriating their technology in order to seek out any other remaining colonies of humans in the universe. I liked the story, and I liked the setting and fantasy elements, especially the Sacerdotes and the different types of dragons. I also liked how it posed questions, such as who is really the more barbaric out of the humans and the aliens. I did struggle to empathise with the main character – as I did in Suldrun’s Garden – but with a story as short as this one it feels pointless to gripe about such things. All in all, I had fun with this one - although I'm not sure I would have enjoyed it quite as much had it been any longer . . .
For Ulfar Thormodsson, the Viking town of Stenvik is the last stop on a two-year-long journey, before he goes home. But for other, larger powers, Stenvik is about to become the meeting ground in a great war: one that will see a clash of the old gods versus the new White Christ. One that will see blood wash the land. As Ulfar becomes ever-more involved in the politics of the town, and prepares to meet these armies in a battle for Stenvik's freedom, he is about to learn that not all his enemies stand outside the walls. I’ve had my eye on this book for a while, and finally decided to buy it whilst I was in York (or ‘Jorvik’!) for the weekend. After visiting the castles and dungeons and museums (and, of course, the Viking Centre) I was very much in the mood for reading something along these lines. Swords of Good Men, book one of Snorri Kristjansson’s Valhalla saga, is a fairly fun bit of reading, once you become accustomed to the unusual format. The plot is quite nicely self-contained and focused: it takes place over the course of a few days, and depicts an attack on the Scandinavian village of Stenvik. We witness the battles, and the events leading up to them, from the point of view of various characters on different sides of the attack. The style and manner of the story are generally effective, but they also have quite a few drawbacks. Each chapter is split into short POV segments, and continually flits about between various characters. You can read a couple of pages focusing on one character, then three paragraphs on another, followed by another page from the point of view of a completely different one. This works great for the most part as it makes for a really fast-paced read, and gives a good sense of chaos during the battle segments. A very large portion of the book is focused on fighting, and the style paints a holistic view of the conflict and helps us understand all aspects of the battle, giving it an almost cinematic feel. However, this structure also makes the non-action segments feel a little disjointed, and doesn’t really allow much opportunity to explore any of the characters in much detail. As a result, it’s difficult to really get on-side with any of the characters, since we don’t know them well enough to empathise. The author’s prose is solid but not spectacular – which, to be fair, contributes well to the gritty atmosphere of the entire novel – and unfortunately many of the characters lack depth as a result of minimal page time and regularly shifting POVs. 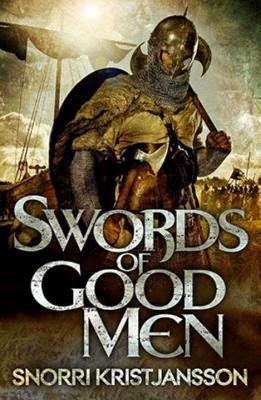 Criticism aside, Swords of Good Men is a decent, bloody, action-filled fictional Viking story. It has plenty of interesting story elements: Old Gods and superstition, the White Christ and black magic, berserkers and assassins, raiders and outlaws, healers and poisoners, blood and longships . . . you get the picture. And while I won’t be rushing out to buy the second in the Valhalla saga, Blood Will Follow, I’ll probably check it out at some point in the future, if only to see what happens in the aftermath of the somewhat shocking ending. Eleven-year-old Arlen lives with his parents on their small farmstead. As dusk falls upon Arlen's world, a strange mist rises from the ground, and hungry demons materialize from the vapours to feed on the living. As the sun sets, people have no choice but to take shelter behind magical wards and pray that their protection holds until the creatures dissolve with the first signs of dawn. This was another re-read for me. I bought and read this book on holiday about four years ago. I’ve since bought both the published sequels in the Demon Cycle, The Desert Spear and The Daylight War, but somehow never got around to reading them. Well, I’ve finally decided to delve back in, starting with a re-read of The Painted Man to refresh my memory. I have to say, returning to the world of wards and Corelings was a lot of fun. The premise of the Demon Cycle – that demons rise from the earth’s core every night to prey on humanity, who just barely manage to keep them at bay with magical wards – is both frightening and fascinating. 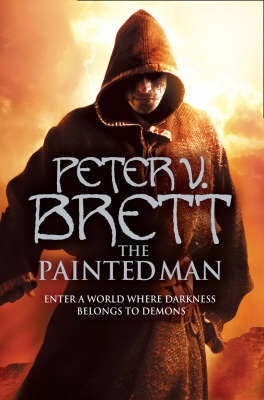 The series can be read as a dystopia as much as a fantasy: the rural inhabitants of Brett’s world were once allegedly much more advanced, with science and machinery and huge civilisations which expanded rapidly in the absence of demons. The humans became so pre-occupied with destroying each other that they fell easily when the demons returned, and most of their knowledge was lost. Once-great civilisations have been reduced to isolated towns and cities, which offer protection from demons but are essentially warded prisons. There were a lot of things from this book that I’d forgotten, but one thing I remember vividly is how much the earlier chapters hooked my interest and began building tension right from the outset. It was great to experience this again, and to feel the palpable fear of the characters: their initial reaction to the bloody aftermath of a demon attack, their dread of the approaching darkness, and their absolute terror the first time we see the wards fail at night. For the most part, I liked and connected with the three main characters, each of whom is given their own individual coming-of-age story. Rojer Halfgrip is an orphaned cripple, who now has to strike out on his own and make his reputation as a skilled Jongleur. Leesha trained for years as a herbalist after her own reputation suffered, and now returns to her village wiser, stronger, and ready to make a difference. And Arlen, forced as a child to watch his mother die after his father’s cowardice during a demon attack, is now well-trained, well-travelled and well-equipped to take the fight to the demons for the first time in thousands of years. Each character has their own strengths, and each are equally enjoyable to read about, although it’s a bit of a shame that Rojer’s tale never really seems to develop into anything more than a sideline. Perhaps he’ll have a bigger role in the next book, The Desert Spear: I’m looking forward to finding out! Tamas's invasion of Kez ends in disaster when a Kez counter-offensive leaves him cut off behind enemy lines with only a fraction of his army, no supplies, and no hope of reinforcements. Drastically outnumbered and pursued by the enemy's best, he must lead his men on a reckless march through northern Kez to safety, and back over the mountains so that he can defend his country from an angry god. With Tamas and his powder cabal presumed dead, Taniel Two-Shot finds himself alongside the god-chef Mihali as the last line of defence against Kresimir's advancing army. Tamas's generals bicker among themselves, the brigades lose ground every day beneath the Kez onslaught, and Kresimir wants the head of the man who shot him in the eye. In Adro, Inspector Adamat only wants to rescue his wife. To do so he must track down and confront the evil Lord Vetas. He has questions for Vetas concerning his enigmatic master, but the answers might come too quickly . . .
I’ve been looking forward to reading The Crimson Campaign for a long time, and more so since my recent re-read of Promise of Blood. The first book in the series ended on something of a cliffhanger, promising huge events to come; and I’m pleased to say that the sequel did, for the most part, deliver them. The second book in the Powder Mage trilogy hits the ground running and is packed with battles, magic and guns. It has a faster pace than the first book, as well as a darker tone. The storylines are harder and grittier, particularly Taniel’s story, which has a much darker arc than the first book. The whole book focuses on an ongoing battle against major odds: all our favourites are outnumbered and outclassed, and not all of them manage to prevail. 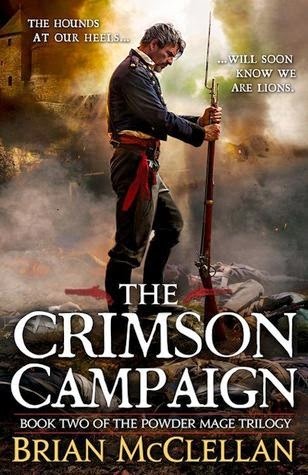 In this respect The Crimson Campaign can occasionally feel a wee bit grimdark; yet it always retains the unique ideas and positive tone of the first book. It’s often said that the middle book in a trilogy is often the weakest, functioning mainly as a bridge between the main events of the beginning and end. While The Crimson Campaign very much has the feel of this sometimes, overall it serves as far more than just the means to an end: it keeps up the pace and builds plenty of momentum for the much-anticipated grand finale (more like The Two Towers than Catching Fire, if you will). There is much more going on here than in the first book: more at stake, more political manoeuvring and more involvement from the other countries which, up until now, we have only heard about. It’s great to see so many new players in the Powder Mage universe, as well as some new settings. That said, it’s also nice to see our favourite characters from Promise of Blood return, along with cameo appearances from characters featuring in some of McClellan’s short stories. I particularly liked the ways in which many of these characters – most of whom have all led separate storylines up until now – begin to come together in interesting ways, while others become further and further apart; and how seemingly minor characters from the first book have now grown in significance, while others have dwindled. I have to say, though: I’m still not a fan of Nila’s storyline, which continues to feel a little laboured and out of place. Neither am I a fan of the book’s ending, which was even more abrupt than that of the first; and while I enjoyed Taniel’s storyline, I felt it went off in a different direction than it seemed to have been headed, and was a little disappointed. I loved the fast pace of The Crimson Campaign, but didn’t quite enjoy the story as a whole as much as I did when I first discovered the world in Promise of Blood. That said, I’ll still likely pre-order the third in the series (The Autumn Republic) as soon as it becomes available, and can’t wait to see how the Powder Mage saga ends.